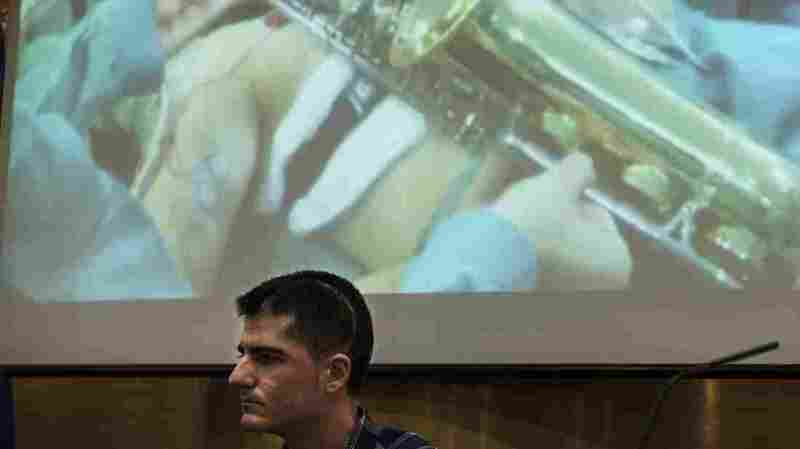 Brain Surgery Serenade: Man Plays Saxophone During Tumor Removal : The Two-Way Partially sedated, Spanish musician Carlos Aguilera played "Misty" and read sheet music to help neurosurgeoons preserve his talents. Carlos Aguilera recently discussed how he played the saxophone during surgery to remove a brain tumor at Regional Hospital of Malaga, in Andalusia, Spain. The team of doctors who recently operated on Spanish musician Carlos Aguilera's brain wanted to be sure they didn't affect his ability to play the saxophone – so they had him play songs during a 12-hour surgery. A partially sedated Aguilera obliged, playing "Misty" and other songs, in addition to reading sheet music. In a video of the procedure, the mellow tones of Aguilera's saxophone blend in with the normal sounds of an operating room. "The 27-year-old was sedated, on painkillers, but remained conscious during the entire multi-hour operation. "Doctors were removing a brain tumor, and wanted to ensure the surgery wouldn't damage Aguilera's musical ability. It was the first such surgery of its kind in Europe. "The operation took place in October, and Aguilera recently went public to say he's been cured — and continues playing his sax with an orchestra in the southern city of Malaga." At a news conference this week, Aguilera's father told journalists that when his son was diagnosed with a brain tumor earlier this year, he feared the worst – including the possibility that he might never play music again. "Two months ago I was on the table, and now I have a life in front of me," Aguilera said, according to La Opinion of Malaga. "I've been reborn." It's the first time such a case has been reported in Spain; similar measures were taken during recent brain surgeries in the U.S. and elsewhere — including last summer, when Slovenian opera singer Ambroz Bajec-Lapajne sang portions of Franz Schubert's Gute Nacht during surgery for a brain tumor. In August, Bajec-Lapajne posted a video of his performance in the operating theater. "All is fine until min. 2:40 when things start to get very interesting," Bajec-Lapajne said of the video. "It's been more than a year since and I'm doing fine, continuing my professional singing career." In June, guitarist Kulkamp Anthony Dias played the Beatles' "Yesterday" and other songs during a surgery to remove a tumor in Brazil. Last year, former Lithuanian National Symphony Orchestra violinist Naomi Elishuv played during a procedure in Tel Aviv to correct tremors that ended her career. Also in 2014, American concert violinist Roger Frisch underwent a procedure similar to Elishuv's to free him from essential tremors. In 2008, bluegrass legend Eddie Adcock played banjo during neurosurgery to correct similar involuntary tremors.